During the past decade, Washington has repeatedly failed to gauge the extent of Palestinian anti-peace sentiments with devastating consequences. The July 2000 Camp David summit triggered the worst wave of Palestinian violence since 1948 (euphemized as the "al-Aqsa Intifada"); the Palestinian parliamentary elections of January 2006 led to a victory for the Hamas Islamist group. Now that President Obama has announced his ambitious timeline for Israeli-Palestinian peace, could the administration be rushing headlong into yet another diplomatic failure? A recent nine-week study by the Foundation for Defense of Democracies (FDD) of online Palestinian political sentiments suggests that this could be the case. Palestinian Internet users often derided diplomatic initiatives, and their discussion of the peace process was overwhelmingly negative. More alarmingly, the study revealed several troubling trends among Palestinian social media users—notably the prevalence of Islamism, fissures between factions, and the inability of liberal reformers to be heard—that cast doubt on both the prospects for peace and the likelihood that a democratic Palestinian state will emerge. 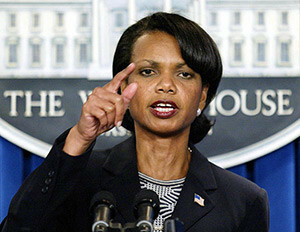 Secretary of State Condoleezza Rice excused the administration's failure to anticipate Hamas's landslide victory in the 2006 Palestinian parliamentary elections as "not having a good enough pulse" of Palestinian society and politics. For years, reliance on faulty poll data and input from "experts" on the ground has thwarted Washington's ability to take the Palestinian pulse. The George W. Bush administration's decision to support the Palestinian legislative elections in January 2006, for example, was due, in no small part, to polling data that all but guaranteed a Fatah victory over Hamas. The polls were produced primarily by Khalil Shikaki, the director of the Ramallah-based Palestinian Center for Policy and Research, which conducted three studies of Palestinian opinion in June, September, and December 2005. These indicated that Fatah's support among Palestinians ranged from 44 percent to 50 percent while support for Hamas ranged from 32 to 33 percent. "With each new Shikaki poll," Middle East scholar Martin Kramer noted, "U.S. policymakers grew more lax when it came to setting conditions for Hamas participation." Reliance on these polls proved a grave error, as Hamas won the election by a landslide. The Islamist faction, best known for acts of violence against Israel, claimed 76 of 132 seats (74 under the Hamas banner, plus 2 independents), granting it the right to form a government. In the end, more than one million Palestinians cast their votes in what observers considered a relatively free and fair election—a rarity in the Arab world. What went wrong? Shikaki's critics alleged that his polls may have been part of Fatah's election strategy to project its strength. But whatever it was that led Washington astray, the outcome of the elections made clear that the U.S. government lacked a reliable read on the Palestinian street. As former secretary of state Condoleezza Rice said of Hamas's victory in congressional testimony, "I've asked why nobody saw it coming … It does say something about us not having a good enough pulse." Four years later, Washington may still be unable to assess Palestinian allegiances in the West Bank and Gaza, and the stakes are even higher. Despite the fact that their Internet access is free of outside manipulation, most Palestinian activists do not reveal their names online. Indeed, few Palestinians maintain personal Facebook or Twitter accounts, presumably to ensure that their viewpoints or posts cannot be attributed to them directly. Rather, the majority of Palestinian web users engage in political debate on impersonal discussion boards. Writing under pseudonyms, they maintain anonymity while discussing the most heated issues of the day without fear of retribution. The bulk of Palestinian political discussion online takes place on these web forums, which typically provide space for like-minded people to express their views. For example, some are pro-Hamas (paldf.net) whereas others are pro-Fatah (palvoice.com). And while some sites feature adversarial posts, such as pro-Hamas users posting on Fatah sites, most are dominated by sympathizers of the owner faction. In a sense, the tribalism and factionalism that traditionally dominate Palestinian society can be observed in the form of similar groupings online. Groups allow individuals to break with their thinking, but only to a point. The survey sought, inter alia, to shed light on the desire for political reform in the Palestinian territories, "third party" alternatives to Hamas and Fatah, and nonviolent or moderate political ideologies. It found some discussion about such issues among Palestinian Internet users in the West Bank but did not identify any discussion threads that addressed this issue in the Gaza Strip—an apparent affirmation that Hamas does not welcome secular reform parties under its rule. The now-defunct Third Way (al-Tariq al-Thalith) was, until 2007, probably the most recognizable Palestinian reform faction. It advocated land for peace with Israel in accordance with U.N. resolutions 242 and 338, renounced violence, and rejected the implementation of Islamic law (Shari'a) in Palestinian society. The faction also called for a total overhaul of the Palestinian security apparatus. Formed in 2005 by current Palestinian Authority prime minister Salam Fayyad, its founding can be attributed to a rejection of both Fatah's corruption and Hamas's extremism. In the January 2006 Palestinian parliamentary elections, Fayyad and former Palestine Liberation Organization (PLO) spokeswoman Hanan Ashrawi headed the Third Way list but won only two of the Legislative Council's 132 seats. The faction folded when Fayyad became prime minister in June 2007. Since then, world leaders have come to view him as crucial to Palestinian reform. In the Palestinian web forums, Fayyad dominated much of the discussion but was generally described as prime minister—not a reformer. Discussion about Fayyad was divisive, attracting intense criticism from both supporters and opponents of the Palestinian Authority (PA). For example, some forums circulated a pro-Hamas Palestine Information Center article titled "Salam Fayyad: Master or Puppet?" praising the prime minister's intellect but warning that he lacked the political expertise to lead effectively. Radicalized forum users also re-posted editorials claiming that Fayyad's government has no constitutional legitimacy. Others noted that Fayyad's role as financial gatekeeper had sparked tension among Fatah leaders as had his plans to declare a Palestinian state in 2011 without Hamas's involvement. Another widely circulated article, "When a Fighter Turns into a Spy," criticized Fayyad's "economic peace" for turning "resistance fighters" in the West Bank into "tools of the occupation." When Fayyad condemned the June 2010 attack that killed an Israeli police officer in Hebron, he prompted critical comments on the pro-Hamas paldf.net website and the Iraq-focused, jihadist site alburaq.info. Whereas Fatah sympathizers used their forums as a platform to criticize their opponents (especially Hamas), few users, with the exception of a handful of bloggers, expressed viewpoints conducive to political reforms in the West Bank. Indeed, the lack of positive sentiment or even mentions of Palestinian reform was one of the most important findings of the study. This runs counter to Fayyad's image in the West where he is widely revered for revitalizing the West Bank, reforming state institutions, and presiding over unprecedented Palestinian economic growth. So much so that New York Times columnist Thomas Friedman coined the term "Fayyadism" to describe his approach to Palestinian governance: basing legitimacy on transparent and efficient administration, rather than the rejectionism, personality cults, and security services that marked Yasser Arafat's regime. Yet, online discussions indicate that Palestinians often regard Fayyad as a Western puppet in general and a collaborator with Washington and Jerusalem in particular. Some Palestinians believe Fayyad remains in office only to please Western donors. This suggests that the higher quality of life and political changes Fayyad has delivered to the Palestinians may be less important to them than the perceived need for conflict with Israel. While political reform lacks support in the Palestinian web environment, Islamism is alive and well with Hamas maintaining a particularly strong presence. Palestine's Dialogue Forum is a popular forum that draws high traffic from readers of Hamas's official media page, the Palestinian Center for Media. Hamas also maintains a strong presence on the "I'm the Muslim" Network for Islamic Discussion, which hosts heated debates among jihadists. It also regularly posts press releases from Fatah's armed wing, the al-Aqsa Martyrs' Brigades, and the global Islamist group Hizb at-Tahrir. Hamas is also active on al-Jazeera Talk, which maintains a steady presence of Muslim Brotherhood supporters, as well as Salafists and al-Qaeda sympathizers. Palestinians on these forums expressed dissatisfaction about the Hamas-Fatah conflict, but Hamas supporters only occasionally engaged their Fatah foes on Fatah forums. More often, they used the forums to reinforce their own opinions. Palestinian Internet users slammed Fatah for its continued reliance on the United States, Jordan, and Israel to maintain security in the West Bank. They also accused the Fatah-led Palestinian Authority of torture and murder, denigrated West Bank police as "Abbas's militias," and referred to the detainment of Hamas members as "kidnappings." Rather than seeking unity with their more secular foes, many online Hamas supporters occupied themselves with the challenge of reconciling Hamas's ideology with that of more radical users. While numerous Salafist sites (mojahden.net, atahadi.com, hanein.info, alrepat.com, alqimmah.net, and almedad.com) criticized Hamas, debates between Salafist sympathizers and Hamas supporters were more commonly found on larger, ideologically diverse forums such as aljazeeratalk.net and muslm.net. During the monitoring period, political sub-forums on aljazeeratalk.net hosted heated debates on questions of Islamic piety between Salafists and users who sympathize with Hamas and its parent organization, the Muslim Brotherhood. From time to time, one poster would declare another takfir (an accusation whereby one Muslim accuses another of apostasy). Salafists and Hamas, however, showed no disagreement on the topic of Israel. It should come as no surprise, then, that the resumption of Palestinian-Israeli peace talks prompted a flurry of discussion on pro-Hamas sites wherein users generally agreed that the move "does not reflect the will of the Palestinian people." Online conversations reflecting Salafist influence addressed a range of topics, first and foremost the prospect of violence against Israel in religious terms. In the views of many Salafist users, jihad is a legitimate method of resistance to Israel and an obligation for all Muslims as Israeli control over what they regard as Muslim lands merits violence. Other issues that attracted Salafists' attention include the alleged corruption of Fatah leaders, coupled with the notion that they served as agents of the West; descriptions of Israeli "occupation" as part of a broader theological battlefield, including conflicts in other Muslim countries (such as Iraq and Afghanistan); the practice of takfir (declaring one's Islamic opponent an apostate) on less religiously-committed Palestinians; and the implementation of Shari'a in an eventual Palestinian state. One particularly revealing discussion surrounded al-Qaeda's popularity among Palestinians. Palestinian users on aljazeeratalk.net wrote that they "respect" al-Qaeda but do not believe that Salafist ideology is popular among Palestinians. Others disagreed. One Palestinian forum member explicitly disavowed support for al-Qaeda, saying that he used to take pride in the group but that its supporters on the forum showed him that they "surpass even Fatah in their hatred for Hamas," prompting two other users based in the Palestinian territories to express similar views. There was also some evidence of friction between Salafists and Hamas. Many of the Salafi users on mojahden.net, atahadi.com, and almedad.com condemned Hamas for "waging war" against Salafists in Gaza, pointing to the bloody August 2009 clashes between the group and members of the Salafist faction Jund Ansar Allah (JAA) in the Gaza Strip town of Rafah. Hamas supporters expressed anger that JAA had declared takfir on Hamas; JAA supporters denied that it had while Salafists criticized Hamas for cracking down on JAA operatives in Gaza. Forums at mojahden.net, atahadi.com, and almedad.com also proved fertile ground for Salafist Palestinians to express their ideologies and condemn Hamas for being "un-Islamic" and forsaking the fight against Israel in the interest of staying in power. Salafist users on muslm.net openly referred to Hamas leaders as infidels. Several posts suggested deeper Salafist penetration of Palestinian society. The Salafist site alfaloja.net, for example, re-posted reports from the Israeli newspaper Ha'aretz that al-Qaeda operatives in Yemen had sent West Bank militants a guide detailing how to use a car engine to build a light aircraft that could be used to launch attacks against Israel. A regular contributor on aljazeeratalk.net denied these allegations but acknowledged the existence of ties between al-Qaeda and certain Palestinian groups. Like the Salafists, Hamas supporters generally favored continued attacks against Israel. A handful of pro-Hamas users on aljazeeratalk.net and paldf.net even called for attacks from the West Bank. One user stated that rocket attacks from Gaza were no longer necessary since Gaza had been "liberated" after Israel's unilateral withdrawal from the territory in 2005, but this was a minority opinion. One lively debate on paldf.net illuminated divisions over Hamas's strategy. Discussing the future of Hamas rule in Gaza, the group's online supporters disagreed over the wisdom of direct confrontation with Israel but ultimately discussed how Hamas should bring rival factions into the fight against Israel instead of clashing with them. In short, the Palestinian social media environment offers no indication that Hamas seeks peace with Israel. There were no scored posts on this topic on any of the pro-Hamas forums. Nor were there any posts attributed to pro-Hamas users on this topic on other web forums. All in all, Palestinian Islamist activity online mirrors what many observers have already reported, namely, that Salafism has a growing number of adherents online and that rejectionism is the dominant position among Hamas users online, casting doubt on claims that the group privately wishes to negotiate peace with Jerusalem and Washington. Finally, Hamas remains entrenched in a civil war with Fatah and does not appear eager to end it, as evidenced by the repeated online attacks it has launched against the rival organization. Relevant posts scored over the course of nine weeks reveal Fatah to be a faction in disarray. Indeed, the organization has undergone something of an identity crisis since the collapse of the Oslo process in 2000 and 2001. From a political perspective, Fatah lacks leadership. From an ideological perspective, it lacks direction. Palestinian web users indicated this repeatedly on Fatah's two online forums: Voice of Palestine and Fatah Forum. For example, the announcement that Mahmoud Abbas would meet with the American Israel Public Affairs Committee (AIPAC) during his June 2010 visit to the United States prompted anti-Fatah users to post scathing criticisms of both AIPAC and the Palestinian Authority president. Fatah supporters largely ignored the visit until reports surfaced of Abbas's statement that he "does not deny the Jews' right to the land of Israel" (translated by major Arab news outlets as "right to land in Palestine"), prompting discomfiture among Fatah's online supporters. Fatah users posted divisive comments on the Voice of Palestine site, lamenting Fatah's renunciation of armed resistance and even admitting that the movement is "in decline." Fatah supporters also weighed in on a Palestinian attack on an Israeli patrol in the West Bank town of Hebron that killed one Israeli police officer and wounded three others. They re-posted articles carrying the PA's condemnation of the attack even as Hamas supporters and other users accused the PA of "valuing Jews more than Palestinians." Ironically, it was ultimately Fatah's al-Aqsa Martyrs' Brigades that claimed responsibility for the attack (along with a new group called Martyrs of the Freedom Flotilla), highlighting the deep divisions within Fatah itself. On the issue of violence, Fatah supporters online fall into two camps of roughly even strength: those who support nonviolent means of protest and those who yearn for a return to the "Second (al-Aqsa) Intifada" of 2000-05. Whether this correlates to the way Fatah members actually view conflict with Israel will need to be verified. Nonetheless, most Fatah supporters on the web embraced the notion that Israel was an enemy rather than a peace partner. One particularly popular post during the study period was a report that appeared on Fatah forums alleging that Israel seeks to "separate Gaza from the West Bank" and, thereby, "liquidate the Palestinian national project." This, however, did not prevent these supporters from voicing loyalty to the Fatah leadership despite its engagement in negotiations with Israel. During the observation period, despite positive developments from the Palestinian perspective, a noticeable majority of Palestinian social media commentary on the peace negotiations was negative. In his address to the Muslim world from Cairo on June 4, 2009, President Obama declared that the Palestinians' situation was "intolerable." He has since pressed Israel to cease all development in the West Bank and placed an unprecedented emphasis on freezing construction in East Jerusalem. U.S.-Israel relations came under particular strain in March 2010 when Israeli prime minister Benjamin Netanyahu visited the White House. Amidst a disagreement over building in the West Bank and East Jerusalem, Obama reportedly humiliated the Israeli prime minister by walking out on the Israeli delegation to have dinner with his family. While Netanyahu and Obama had a more cordial meeting in July, Israelis continue to distrust the president. According to a March 2010 poll, 9 percent of Israelis said that Obama's administration is pro-Israel while 48 percent called it pro-Palestinian. These sentiments likely hardened in July after the Obama administration upgraded the diplomatic status of the Palestinian Authority in Washington to that of a general delegation, which was largely viewed as a step toward Palestinian statehood. Yet despite these advances for the Palestinians, they showed little optimism online about the U.S.-led peace process. The study analyzed sentiment on a variety of topics, including religious and political reasons for rejecting the peace process; rationales for refusing to deal with Israel; mistrust of Israel's motives; the perception that peace talks are futile; mistrust of the United States as a negotiator; anger at the PA for "selling out the resistance"; and an overall unwillingness to compromise on key issues such as borders, settlements, and the right of return—the standard Palestinian and Arab euphemism for the demographic destruction of Israel. Users on pro-Hamas forums such as mahjoob.com and paldf.net asserted that the return to peace talks "does not reflect the will of the Palestinian people" and decried the recent U.S. move to transfer $150 million to the PA as "bribery." The website paldf.net, which is popular among supporters of Palestinian militant groups, served as a venue for Palestinian Islamic Jihad and the Popular Front for the Liberation of Palestine to post statements rejecting the resumption of negotiations. Indeed, most users on a broad spectrum of Palestinian sites viewed violence as a legitimate alternative to negotiations and rejected Israel's political and territorial claims. Users on forums such as arab-land.net and the radical blog gulooha.blogspot.com distributed editorials expressing negative sentiments about the peace process by Egyptian columnist Fahmy Howeidy, as well as al-Quds al-Arabi editor Abdul Bari Atwan, who raised the specter of an "open intifada" in the West Bank. An article on the Islamist website islamtoday.net echoed these sentiments, noting that an impasse in the peace process could turn into an "armed uprising." Palestinian Internet users often dismissed potentially positive diplomatic steps. Abbas's June 2010 visit to the U.S. prompted a flurry of negative responses, including pointedly derogatory comments surrounding his meeting with AIPAC. And as also noted above, even on pro-Fatah sites including palvoice.com, Fatah members lamented their leaders' renunciation of armed resistance. One popular posting (re-posted on the Arabic blog aggregator amin.org and the reform-leaning alhourriah.ps) asserted that Israel was incapable of "unilateral" peace due to a lack of political will and that the two-state solution was "on its deathbed"—meaning that the Palestinians needed to consider a one-state solution to the conflict. Many Palestinians do not support the efforts to achieve peace. Despite the Obama administration's recent push to bring an end to the Palestinian-Israeli conflict and perhaps even help the Palestinians declare a state, not to mention its online efforts through a State Department initiative to win Palestinian hearts and minds, Palestinian web users show a distinct lack of interest in peace. The language of rejectionism remains prevalent, commentary on peace talks is overwhelmingly negative, and potentially positive diplomatic steps are generally ignored. Palestinian Salafism is on the rise. There is a small but distinct Salafist influence in the Palestinian online environment. Whether this translates to growing popularity on the ground in either the West Bank or the Gaza Strip remains a subject of debate. Yet Washington cannot discount the potential for cooperation between Salafists and Hamas. Fatah, which currently represents Palestinians in the U.S.-led peace talks, is in disarray. Fatah's online supporters typically vilified Israel, and few expressed positive sentiments about peace. They break down into two factions of roughly equal strength: one that supports nonviolence, and one that seeks armed conflict and terrorism against Israel. The Islamist Hamas shows little desire for a negotiated peace with Israel. While Hamas is not monolithic, nearly all of its supporters on the Internet continue to support violence against Israel. On this issue, Hamas showed no apparent disagreement with Salafists. On the contrary, Hamas's online supporters often seek common ground with these radical groups. The three-year conflict between Hamas and Fatah is not likely to end soon. The two sides regularly trade barbs online, and the study found little evidence of rapprochement. Indeed, Hamas members appeared to be more interested in reconciling with Salafists than with Fatah members. Social media suggests that the Palestinian internecine conflict stemming from Hamas's violent 2007 takeover of Gaza remains a challenge to the Obama administration's peace plan. Palestinian reform factions are weak. These groups have little influence online, raising red flags about institution building and liberalization. The lack of positive sentiment, or even mentions of Palestinian political reform, is striking. This raises troubling questions about the Obama administration's lack of emphasis on Palestinian political institutions as well as concerns about the viability of a Palestinian state if one is to be created. Apparently displeased with the findings of this study, Palestinian pollster Khalil Shikaki has reportedly dismissed "the idea of having a representative sample by looking at the Internet" as "absolutely ridiculous." Yet it is precisely because Palestinian polling data (including Shikaki's own) has been so wildly inaccurate that the need to gauge Palestinian public opinion by alternative means has become so urgent. Indeed, while it remains unclear how accurate social media is as a bellwether of Palestinian political beliefs, the administration should consider the extent to which these findings represent the broader Palestinian population, perhaps through additional long-term studies, preferably before Washington suffers more humiliating setbacks in its efforts to promote Middle East peace. FDD selected ConStrat, a Washington, D.C.-based web analysis company, to collect data for this study. ConStrat used advanced technology usually employed on behalf of U.S. Central Command (CENTCOM) to cull information from search engines, unstructured social media sites, YouTube, Twitter, social networks, wikis, and RSS feeds. From May 3 through July 3, 2010, ConStrat viewed approximately 10,000 Palestinian social media entries and analyzed approximately 20 percent of them based on their relevancy. In the end, the company analyzed 1,788 statements contained within 1,114 unique posts across 996 threads written by 699 authors. When substantive discussion threads —positive or negative—matched our taxonomy on topics ranging from jihad to reform, we included them in our study. In short, the study surveyed the breadth of opinion on the Palestinian web in Arabic. It was difficult to pinpoint the exact level of Internet usage among Palestinians. Freedom House estimates that only 4 percent of Palestinian houses have an Internet connection while the Palestinian Central Bureau of Statistics estimates that in 2009, 28.5 percent of Palestinian households had Internet access, though these statistics do not account for the widespread use of hundreds of Internet cafés in the Palestinian territories. However, while social media users represent a small and better educated segment of Palestinian society, online social networks provide important political insights because they grant their users anonymity and freedom of expression. This is particularly true with regard to the Palestinian online environment, which is remarkably open, unlike that of the majority of the Arab world, as Israel provides the Palestinian territories with unfettered internet access. FDD instructed ConStrat not to provide percentages for the sentiments and trends observed in this study. Indeed, we believed percentages would reinforce a disingenuous notion that ours was a statistical survey. The goal was simply to provide an accurate snapshot of what Palestinians were saying online during a nine-week period and share those results in an effort to prompt further study and exploration. Jonathan Schanzer and Mark Dubowitz, "Palestinian Pulse: What Policymakers Can Learn from Palestinian Social Media," Federation for Defense of Democracies, Washington, D.C., Oct. 19, 2010. PSR Index of Polls: Polls conducted since the year 2000, Palestinian Center for Policy and Research, Ramallah, accessed Oct. 27, 2010. Martin Kramer, "Polls that Hid Hamas," Sandbox, Jan. 28, 2006. "Nata'ij al-Intikhabat at-Tashri'iyya 2006," Palestinian Central Elections Committee, Ramallah, Jan. 29, 2007. Kramer, "Polls that Hid Hamas." The New York Times, Jan. 30, 2006. Kevin Peraino, "Palestine's New Perspective," Newsweek, Sept. 4, 2009. Keir Prince, "Palestinian Authority Reform: Role of the International Community," Arab Reform Bulletin, Carnegie Endowment, Washington, D.C., Nov. 14, 2007. See, for example, "Salam Fayyad: Sayyid am Adah?" Palestine's Dialogue Forum, accessed May 8, 2010. See, for example, "Mufawadat Tahn al-Ma," Palestine's Dialogue Forum, accessed May 4, 2010, and Ard al-Arab, accessed May 4, 2010. "Fatah Tuqirru Mujaddadan bi-l-Khilafat baina Fayyad wa-Abbas," Palestine's Dialogue Forum, accessed May 6, 2010. "Indama Yatahawal al-Munadil ila Jasus," Abu Mahjub, accessed May 19, 2010. Ynet News (Tel Aviv), June 14, 2010. "Atfal Ghaza Yahrukun Suwar li-Salam Fayyad fi Lailat Tawaqquf Mahattat Kahraba Ghaza," Palestine's Dialogue Forum, accessed June 27, 2010; "Jama'a Tutliqu ala Nafsiha Shuhada'a Ustul al-Hurriyya Tatabanna Maqtal Shurti Israil[i] fi-l-Khalil," Muntadayat al-Buraq al-Islamiyya, accessed June 15, 2010. Thomas Friedman, "Green Shoots in Palestine," The New York Times, Aug. 4, 2009. See, for example, Maan News Agency (Bethlehem), July 7, 2007; The Daily Star (Beirut), Aug. 18, 2007. The Wall Street Journal, Oct. 15, 2009. See, for example, "Al'an Milishiyat Dayton Tashunn Hamlat I'tiqalat Sharisa Taalat Ru'asaa Baladiyyat wa-Qiyyadat Hamas," Palestine's Dialogue Forum, accessed May 25, 2010. See, for example, "Taher Annunu: Taqdiruna al-Amiq li-l-Dawr at-Turki bi-Itijah al-Qadiya al-Filistiniya," Palestine's Dialogue Forum, accessed May 5, 2010; "Dhikra Amaliyat Rishon Le-Zion al-Butuliya: Tabannaha al-Qassam ba'da 6 Sanawat," Palestine's Dialogue Forum, accessed May 7, 2010. Some analysts make a distinction between adherents to Salafism and Salafi-jihadists, who use Salafism to justify violence in the name of this school of Islamic thought. For the purposes of this article, Salafists will describe both subscribers to this fundamentalist doctrine and perpetrators of violence on its behalf. "Ansar Hamas baina al-Aala li-bani Alman wa-l-Ada li-Ahl at-Tawhid," al-Jazeera Talk, accessed June 10, 2010. Barak Mendelsohn, "Hamas and Its Discontents," Foreign Policy, Sept. 9, 2009. "Al-Qaeda Baathat Mua'kharan bi-Kurrasat Irshad li-Nashataiha fi Ghaza … Ha'aretz Tazaama anna at-Tanzim Yadfau bi-Itijah Muwajaha baina Hamas wa-Israil al-Ithnain," al-Faloja, accessed May 24, 2010. "Ha'aretz: al-Qaeda fi-l-Yemen Tursil Mudarribin ila Ghaza," al-Jazeera Talk, accessed June 1, 2010. BBC News, Sept. 12, 2005. "Ra'i fi Muqawamat Ghaza wa-Ru'ya li-l-Marhala al-Qadima," Palestine's Dialogue Forum, accessed June 19, 2010. The New York Times, Mar. 10, 2009. "Palestine: Salvaging Fatah," International Crisis Group, Middle East Report 91, Nov. 12, 2009. "Indama Nataqaha ar-Rais al-Filastini: Abbas Yu'akkid ala an li-l-Yahud Haqq fi Filastin," Aqsaa.com, accessed June 15, 2010. Ha'aretz (Tel Aviv), June 10, 2010. "Kalam…fi…al-mamnua," Palvoice, accessed June 13, 2010. "Hukumat Fayyad tudin maqtal shurti Isra'ili," Muntadayat al-Qumma, accessed June 16, 2010. "Al-Muqawama al-Filastiniyya taqtul dabitan kabiran fi Jaysh al-Ihtilal fi amaliyya naw'iyya bi-l-Khalil," Muntadayat al-Wadad, accessed June 15, 2010. See, for example, "Fatah tuhathir min al-Mukhattat al-Isra'ili li-Tasfiyat al-Mashru al-Watani al-Filastini," Muntadayat Intifadat Filastin, accessed June 16, 2010. Barack Obama, "The Cairo Speech," The New York Times, June 4, 2009. The Washington Post, July 7, 2010. Associated Press, July 7, 2010. The Jerusalem Post, Mar. 26, 2010. United Press International, July 23, 2010. "Al-Awda li-l-Mufawadat laysat Qararan Filastini," Palestine's Dialogue Forum, accessed May 9, 2010. "Mufawadat tahn al-Ma'," Ard al-Arab, accessed May 4, 2010. "Al-Muqata'a tughliq Masani Isra'iliyya," Islam Today, accessed May 17, 2010. United Press International, June 10, 2010. See, for example, "Kalam...fi...al-mamnua," Palvoice, accessed June 13, 2010. "Isra'il 2010 ajiza an al-Harb wa-as-Salam wa-l-Ahadiyya Aidan," Shabakat al-Internet li-l-I'lam al-Arabi, accessed May 26, 2010.
 " Digital Outreach Team ," U.S. Department of State, Washington, D.C., Jan. 2009. Jonathan Guyer, "Attitude Problem: What Social Media Can't Tell Us about Palestine," Foreign Policy, Oct. 28, 2010. Related Topics: Media, Palestinians | Jonathan Schanzer | Winter 2011 MEQ receive the latest by email: subscribe to the free mef mailing list This text may be reposted or forwarded so long as it is presented as an integral whole with complete and accurate information provided about its author, date, place of publication, and original URL.